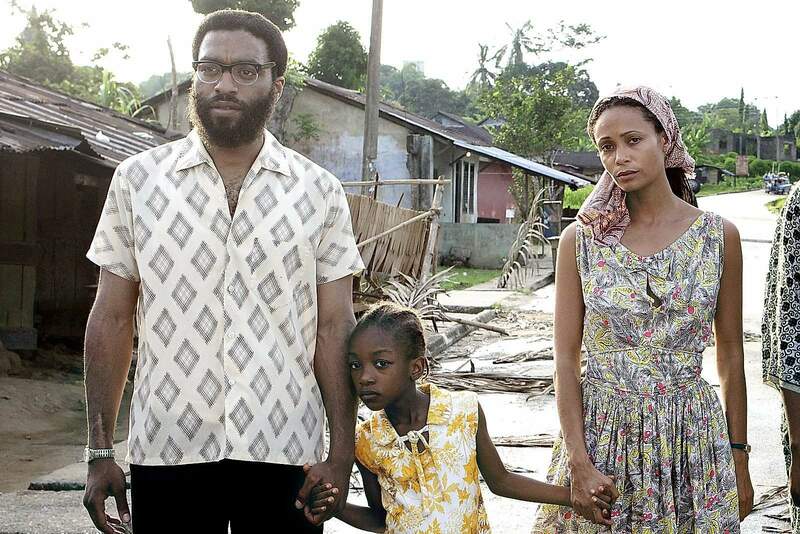 HALF OF A YELLOW SUN is based on the 2006 novel by Nigerian author Chimamanda Ngozi Adichie. The story follows four lives as the Nigerian Civil War descends in 1967. Olanna (Newton) and her twin sister Kainene (Rose) are the central relationship of the story. Their family is wealthy and both the daughters are English educated. They are going to make a mark in Nigerian society. The quartet is rounded out by Olanna’s boyfriend, an academic, Odenigbo (Ejiofor) and his young houseboy Ugwu (Boyega). Olanna and Odenigbo live a non-traditional life in the university town Nsukka. She maintains an apartment, but for all practical purposes moves in with Odenigbo, even though they do not marry. There are frequent gatherings at Odenigbo’s house where the intellectual set from the university talk about the state of the country post independence. They discuss the British. They talk about how Nigeria itself is a colonial construction. Odenigbo says the British made them “Nigerians”. They are really the Igbo, Yoruba, Hausa and Fulani people, he says. Anyone who has recently seen the film HANNAH ARENDT will find an interesting similarity in the portrayals of talky, discontented academic cliques. The houseboy Ugwu watches the comings and the goings of the household. He is from a village and has a more traditional upbringing, yet is loyal to Odenigbo and Olanna. Kainene takes up running the family’s many business interests and has a relationship with another of what her sister refers to as her “English boys” a man called Richard (Joseph Mawle). For her part, Kaneine mockingly refers to Odenigbo as “The Revolutionary”. The narrative jumps back and forth between the establishment of independence in 1963, the military coups of 1966 and the subsequent Nigerian Civil War that began in 1967. The Igbo people want to establish their own state called Biafra in the south-eastern part of the country. The yellow sun of the title refers to the design of the flag for the short-lived Republic of Biafra. The people of the region are locked into a vicious two and a half year war. When Nigeria can gain no more territory through fighting, it blockades Biafra and causes mass starvation and disease. Although estimates of the dead were between 1 and 3 million, this part of the story is not told in harrowing detail. The audience is spared the nightmarish horror of the war in Biafra, but we still see lives torn apart by violence. If war is what happens when diplomacy fails, then this film portrays the collapse of a society as a result of warfare. Director Biyi Bandele has portrayed the epic scale of the book with some success. Life moves slowly from order to chaos. The privileged existence of Olanna and Kainene is challenged in every possible way. Without exception, the women of HALF A YELLOW SUN are strong characters. When their world is falling apart, it is their will that keeps the family together. Thandie Newton is excellent as Olanna, as is Anika Noni Rose playing Kainene. Rose is a Tony-winning American actress who was cast by Bandele on the strength of her performance in television’s The No. 1 Ladies’ Detective Agency. Bandele, who is Nigerian, was under the impression that Rose was South African, which is a tribute to her acting abilities. All the performances in this movie are solid. Bandele’s feature is his first and by his account getting the production made was no certainty despite its being based on an international best seller; Newton and Ejiofor’s casting helped, as well as the many deals done with the Nigerian film industry. Adiche’s novel has won critical acclaim and a dedicated readership. Director Bandele admits that in his adaptation of the novel, he has made different storytelling choices. Although he didn’t seek Adiche’s opinion during the development process, she has seen the film and approves of the result. Bandele’s movie is epic in scope, but it maintains its focus on the personal. This is the only way to let an audience feel history, through its effect on the lives of characters we care about–in this the film succeeds admirably.